Water has the greatest influence on the success of other inputs to create a healthy lawn. It affects plant nutrition, fungal diseases, insect populations and plant stress. The key is to have the appropriate amount of water when and where the turf needs it. Too much standing water at the surface can create poor oxygen exchange, which essentially suffocates the plant. A lack of water in the soil can result in drought stress and wilt. It is ideal to move water into the soil and hold it around plant roots for use as needed. 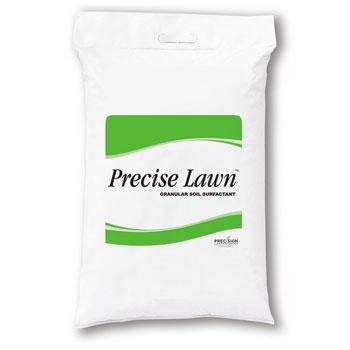 PRECISE LAWN™ is a granular soil surfactant that moves water where it’s needed most and keeps it there over time. Its unique surfactant technology maximizes the flow of water into the soil while also increasing its retention in the pore spaces around plant roots. 5 lbs. per 1,000 square feet.